Have you chosen what you would like on your Christmas Cookie platter yet?? Here is a great addition if you don’t have time for baking! With only a few ingredients needed, this is an easy delicious Christmas treat. My son requested no bakes this year, so this was number one on my list. Recipe is from Del’s Cooking Twist. Everyone loved these delicious treats!! easy no bake cookie perfect for any cookie platter! In a small bowl, melt chocolate chips in microwave until melted and smooth. Add condensed milk and mix until blended. Add 1 cup of coconut, mix. Place mixture in refrigerator, chill for one hour. After and hour, take ¼ tsp of mixture and roll into a ball, stick a hazelnut inside, pinch mixture around nut. Continue this method with the rest of the cookie mixture and nuts. Place in small paper cups. 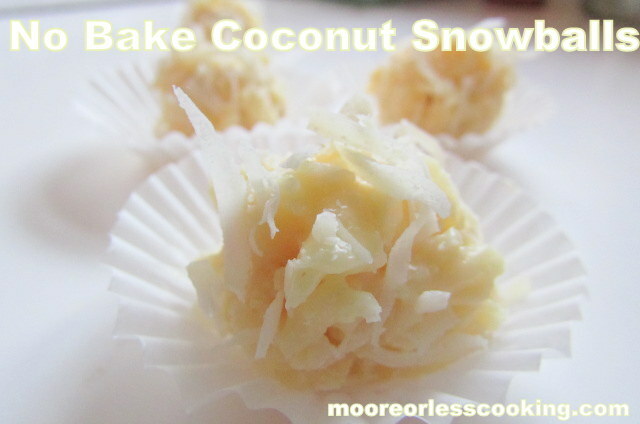 Makes 18 no bake snowballs. oh my! These are WICKED!! I must make them asap! I can’t wait! Thank you Mary, these were a big hit!! These sound awesome! Pinning. My mom loves coconut and she’s love these! Yum! They are amazing Del, hubs favorite! He brought some to work, love it!